San Francisco is a busy and bustling city with an overwhelmingly large amount of boutique hotels to choose from. While its locals are familiar with each hotel’s perks and styles, the first-time traveler may have a tough time finding a hotel that suits their taste and budget. With a staggering 1,864 reviews and a four-star rating on TripAdvisor, Hotel Kabuki is a Japanese-themed hotel that is popular with many travelers. 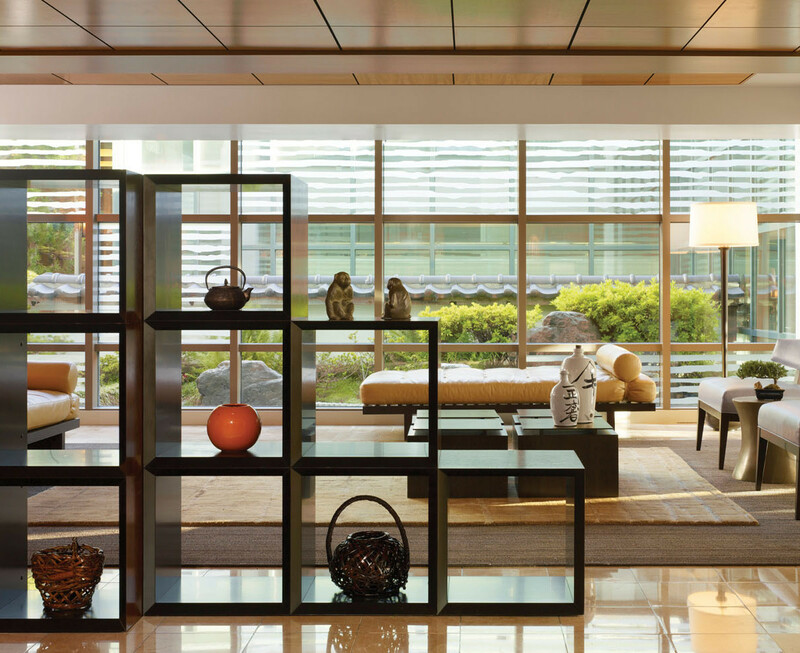 Edo Castle-inspired exteriors, silk screen-adorned rooms, a beautiful koi fish pond and so much more, this hotel gives guests the authentic experience of staying in Japan. 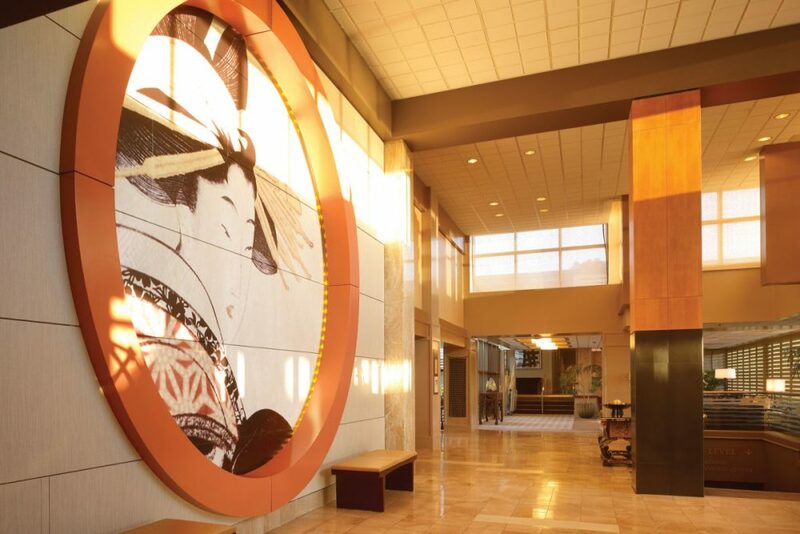 Hotel Kabuki is located in the heart of Japantown and is just a short walk away from many conveniences like Nijiya Market, Daiso, and the Japantown Center Mall, which is filled with plenty of shops and eateries. Looking for karaoke and drinks? Festa is just a short ways away. Craving dessert? Head to Sophie’s Crepes at the mall for some ice cream wrapped in fresh crepes. You’ll find exactly what you need in the area. Hotel Kabuki has a wide range of amenities. Featuring your standard daily breakfast buffet, a beautiful Japanese garden, pet-friendly rooms, in-room spa treatments and even their very own well-received Kabuki Springs & Spa, there is plenty to keep you busy on-site without having to leave the hotel grounds. 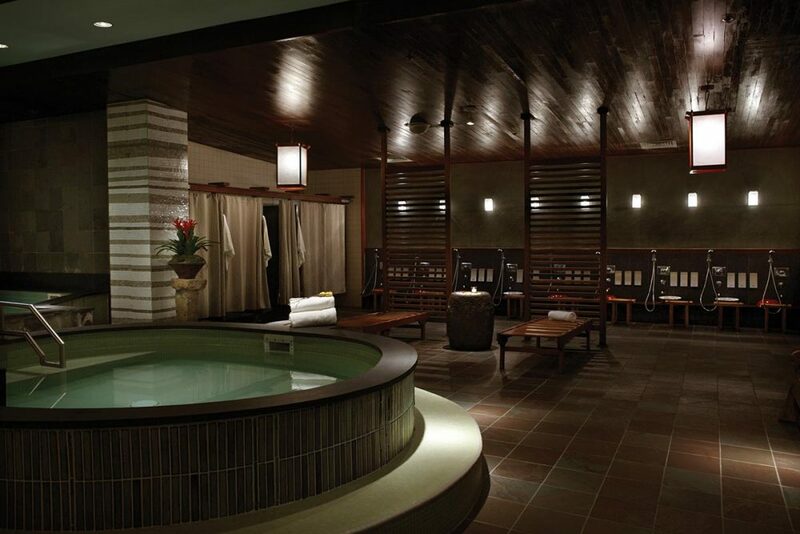 Kabuki Hotel has its very own full-service spa located just two blocks away from the hotel. Treatments available are massages, facials, acupuncture, and even party packages including sushi and massages in your very own private satori room. If treatments are out of your budget, you can enjoy a day at the communal bath for only $25 admission. Featuring a hot pool, cold plunge pool, dry sauna, and steam room, the communal bath is the equivalent of the popular Korean spas. All products at the spa are complimentary, from the sea salts, chilled face cloths and tea. All hotel rooms are decked-out in traditional Japanese decor. With Serta Concierge beds, flat-screen TVs, complimentary Wi-Fi, and a work desk, all rooms feature your standard bedroom essentials. However, Kabuki’s unique touch is their Japanese-style bathrooms: they all feature a deep soaking tub you would see at a Japanese hot spring resort. 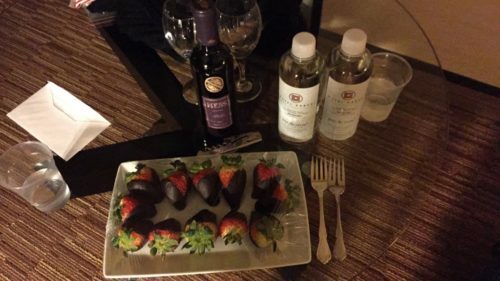 During our first night when we returned to the room after dinner, there was a gorgeous plate of chocolate-covered strawberries and a bottle of wine waiting for us at our coffee table, compliments of the hotel. Having personally worked in the hotel industry, gestures like these are usually meant for VIPs. I was honestly quite surprised to find this platter of delicacies since we looked so young and broke and not worth impressing. I thought this was a beautiful touch! Not gonna lie when I say those were probably the best chocolate-covered strawberries I’ve ever had, and not just because they were free. For a king-size bed at just about any hotel in the area it was roughly $200+ a night, and this was even before taxes. This meant I’d be looking at a $400 minimum for 2 nights. I decided to bookmark my top choice hotels, sign up for their mailing lists and wait until I found a promotion or discount. TripAdvisor eventually had a promotion for Cyber Monday, which brought that rate down to $150 a night. After taxes and fees, my total for 2 nights was $345.77, and we even got a free upgrade to a Corner King suite! Our view of San Francisco in the Corner King suite. When it boils down to it, the service, atmosphere and price of this hotel are very hard to beat. 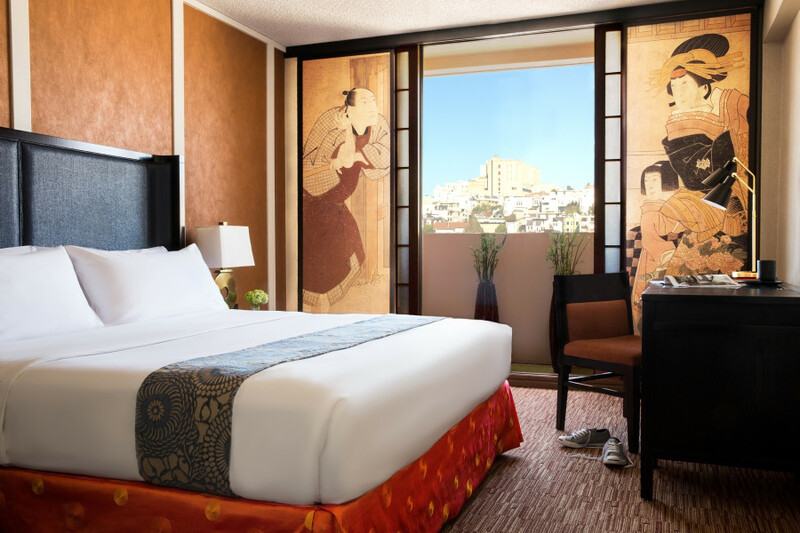 If you appreciate Japanese culture and luxury accommodations with a great value, then plan to room with Hotel Kabuki to book your next stay. Update 2017: According to the company website, Hotel Kabuki is currently undergoing construction and is due for completion in early July 2017. They are currently offering 20% off with no blackouts or restrictions and will place priority to stay in a renovated room. Click here to book your stay.